When Duane Thomas found EMS, he found his calling. Duane came to LifeCare in 2011 as an EMT-B, and went on to complete the Intermediate program in 2015. 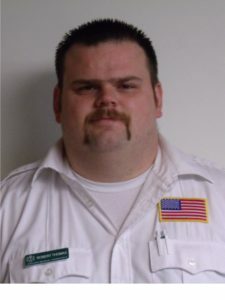 Duane is described by his colleagues as, “professional, caring, and always an advocate for his patients.” While still an EMT-B, Duane was the partner that every medic would want on their crew. Duane always anticipated what the medic would need and would have it ready. Duane is not afraid to offer or take suggestions on a call and is always eager to learn and improve his skill set. Duane always represents LifeCare in a professional and caring manner. The clinical care and comfort of Duane’s patients is always his priority. Duane has earned the respect of the doctors, nurses and staff members of the medical facilities he visits with his patients. Duane’s commitment to excellence in clinical care and customer service is deserving of recognition. Duane’s LifeCare colleagues and supervisors are in agreement that his dedication to providing the best EMS care to the people of the Southwestern region of Virginia is exemplary. LifeCare Medical Transports is proud to recognize Duane as a 2017 Star of Life.